Festival Latino Americano (aka the Latin American Festival) will celebrate two decades in Charlotte when it kicks off its annual festivities on Oct. 10 at Symphony Park, highlighting the diversity of Latino culture through dance, food, visual arts and music. Organizers of the festival, The Latin American Coalition (Charlotte's oldest and largest Hispanic service agency), The Mint Museum and The Latin American Women's Association (a nonprofit organization dedicated to promoting Latino women and their families), said that over the last 20 years, the event — along with the local Latin American population — has grown, cementing itself as a fixture of Charlotte's cultural landscape. 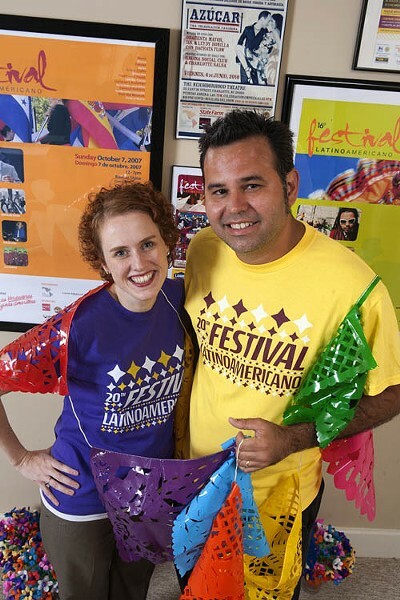 For Jess George, executive director of the Latin American Coalition, events like the Festival Latino Americano provide an opportunity for Charlotteans of all ethnicities to build relationships and find common ground. "I may not speak the same language as you do," said George about what it's like to attend the festival, "but you and I are experiencing the same thing right now." And just as this year's edition of the city's largest Hispanic cultural celebration is bigger than ever, Latino artists and arts organizations — the people and entities responsible for providing the culture — are receiving more support and more funding and producing more than ever before. According to officials at the Arts and Science Council, the public art agent for the city/county and a major fundraiser for local artists and art groups, over the last 10 years Charlotte has seen an increase in Latin American arts projects. Robert Bush, ASC senior vice president for cultural and community investment, said as the area's Latino community expanded, more and more artists and creative people stepped up to seek funding. In the last five years alone, Bush said the ASC has granted an estimated $100,000 to individual Latino artists — such as Stella Hastie, who received a grant of $1,150 to attend the 8th Annual National Latino Writers Conference in Albuquerque, N.M. In 2007, the ASC set up a special fund to support Latino art projects, and, Bush said, because it was so successful, after three years, the program was expanded into the Asian-American, Native-American and the African-American communities. The ASC also saw an increase in the funding of cultural organizations — groups like Art Si, which is a self-described cadre of "Latino artists, organizations and people who advocate for the arts in the Charlotte region who would like to support and identify the many talents that our community has to offer." Irania Patterson, a board member of Art Si (www.facebook.com/artsicharlotte), said that before the group was formed, individuals in the Latino arts community had been getting together informally to promote cultural events. "The only way you could offer a program before was through the churches, but now there is such a captive audience out there that it is easier for the whole community to know what is happening in the Latino community," said Patterson, adding that her group aims to touch more diverse audiences. "Because the mainstream community knows more about the festivals, it is easier to use established channels of communications. But a lot of times, when you have these events, you only see people of those ethnic groups going to these events — and that's something I'd like to break." And community sentiment is changing as well, Bush said. Ten years ago when the ASC would announce funding for a Latino project, Bush would receive nameless phone calls and e-mails demanding to know why the Latino projects were getting money. But he said he doesn't get those calls or e-mails anymore. "The arts are an incredible bridge builder, and it is a tool we need to use in this community to help people understand each other," Bush said. Looking toward the future, George, Bush and Patterson said Charlotte is ready to have a cultural center — similar to the Harvey Gantt Center — that Latino culture and artistic life can come together. In fact, one aspect of Art Si's mission is to "become the premier Latino cultural and artistic resource center (space, virtual space) in the city of Charlotte. We aim to be a one-stop resource center for Latino artists to connect to the available resources, create opportunities to grow and empower their initiatives." "We want to showcase the beauty of all these Latino artists to the whole community," Patterson said. "We've been here for a long time and our population is integrated into the community in all of the sectors, financially, socially and educationally. So, you have Latinos in every sector of our community. The more we integrate, the more we mirror our community. Still, there is a long way for us to go to make the community at large engaged in what we are doing." For details about this year's Festival Latino Americano, visit www.festivallatinoamericano.org.